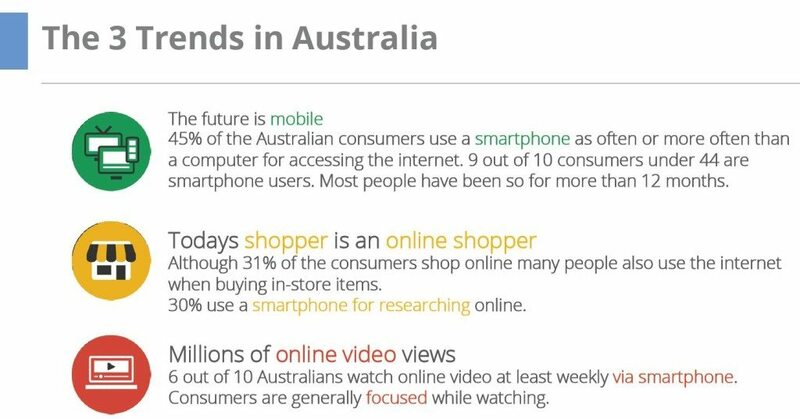 Last month, Google released their 2015 Consumer Barometers for Australia and New Zealand, which contained fascinating insights into how Australians are using the internet, from devices being used to online shopping trends and much more. We’d love to share some of these insights with you so you can see just what your customers are up to online in this new digital era and find out what you need to do to be front of mind for your customers. The overwhelming statistic that shows just how rapidly things have changed in the last few years is the fact that 45% of Australians now access the internet via a smartphone as opposed to a desktop computer. With most households these days owning multiple mobile devices including smartphones, tablets and even smart TVs, this number is no surprise but is also sure to only increase in future as well. At SMX Sydney 2015, a quote was shared that stated more people in the world own a smart phone than own a toothbrush! Another interesting yet unsurprising stat was that while online shopping is fast becoming a common way to shop, people don’t just shop online, they research online before making in store purchases too, with over 30% of people conducting their research on a smartphone. 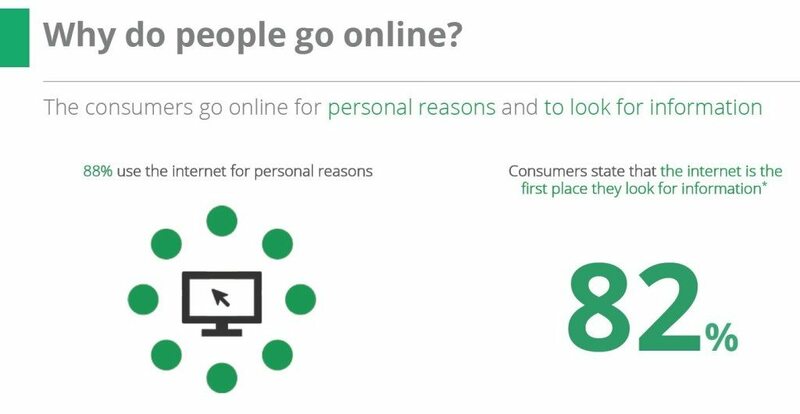 Not only that, but 82% of consumers say that the internet is the first place they go to when looking for information. Gone are the days of turning to newspapers, magazines, encyclopaedias or other people! Not only are Australian consumers online (8 out of 10 are online at least once a day), but they are online when they are watching TV too. 58% of Australian consumers are online while watching television, 60% of the time using a smart phone, 41% using a computer and 33% using a tablet to browse the internet. When it comes to shopping habits, 55% of consumers in Australia do their research online before making a purchase, with 17% conducting their research online only. Industries that are most popular for online research are real estate, hotels, personal loans, flights, ground travel and home appliances. Using mobile devices is all good and well when it works, but what do consumers do when they experience issues accessing websites on their smartphones? Well, 28% of consumers will simply find another website that works better on their smartphone. That’s huge! So if your website isn’t mobile responsive, you could be losing almost a third of your potential clients just because of the way your website looks on a smartphone. You might be thinking, ‘I’m just a little guy with a small local business, how will I able to influence consumer behaviour?’. Well, when it comes to local businesses, 68% of people research local businesses online a day or less before visiting them in-store. That’s a lot of local research and you want to be at the top of your game to make sure you are visible when your local customers search for you as a massive 85% of consumers will only consider 1-3 local businesses before deciding where to buy. You can see the full Cosumer Barometer Country Report 2015 – Australia. If you want to find out how Blue Cherry Online Marketing can help you get great local SEO results, get in touch with our team of marketing consultants who can make sure that you are in the right place when your consumers are looking for you.